The traffic management system (TMS) developed by Cactus is adapted for the specific requirements of rail traffic. Because disruptions often affect all trains on the line, the quality of the traffic management system is critical to the operator. Planning and operating rail traffic is a complex process, however. An operator must be able to make correct decisions – fast. The trend in traffic management systems is therefore towards greater automation and more decision-making support. A Cactus TMS has sufficient capacity to centralise the management of a large number of lines. But it is also sufficiently scalable to act as a local control system to manage individual interlockings. Because we develop most of the software ourselves, we can adapt and add functions to meet our customers’ various requests and needs. 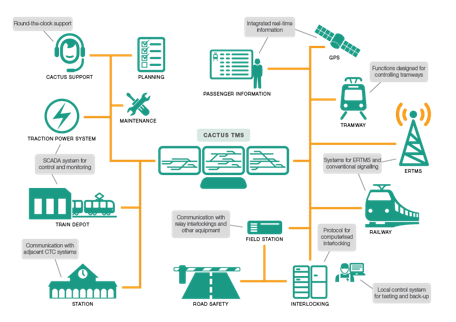 Cactus TMS contains all the functions required for efficient control and monitoring of traffic on the line. 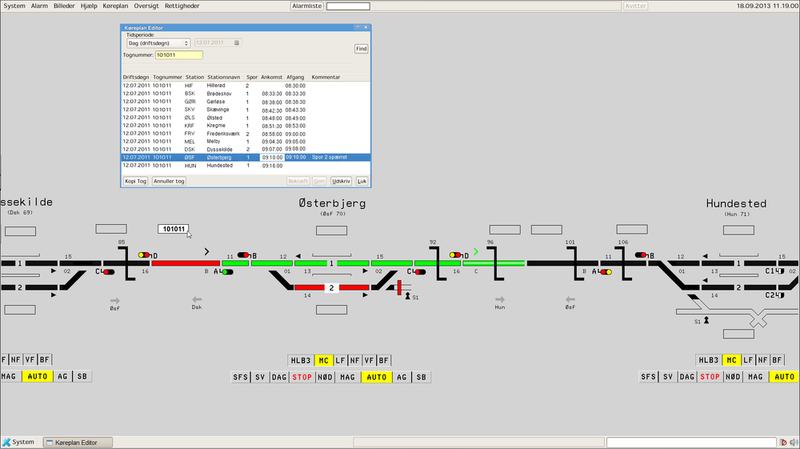 The traffic manager can obtain help within the system, and the overview facilitates the management of rail traffic. In the normal case, all control of the traffic is automatic, based on the timetable or the distance to the vehicle in front. In automatic operation, the system can make changes to reflect the current traffic situation. Where the operator wants to go in and take control manually, this can be done either directly by pointing to the track layout graphics, via commands or by making changes to the timetable data. The design of the user interface is very flexible and can be tailored to our customers’ requirements and standards. The customer can always decide which symbol system to apply. The images are usually based on a ‘macro object’, normally a whole station. These objects then form the basis for creating the various images types that arise: station images, control overviews, panoramic images or panel overviews. From the workplace, the operator is then free to select the images that he or she prefers. The system always includes a tool for generating facilities that enable the traffic manager to create new objects or modify existing objects. Cactus TMS normally controls the traffic entirely automatically according to the timetable. If conflict situations arise as a result of e.g. delays, the traffic manager can either choose to let the system resolve the conflict automatically, based on pre-configured rules, or go in and resolve the conflict manually. As well as being able to influence the automatic system by making changes to the locally stored timetable, operators can also go in during operation and adjust trigger points and times to influence the system. Conflict handling with automated decision support gives traffic managers time to carry out other tasks. 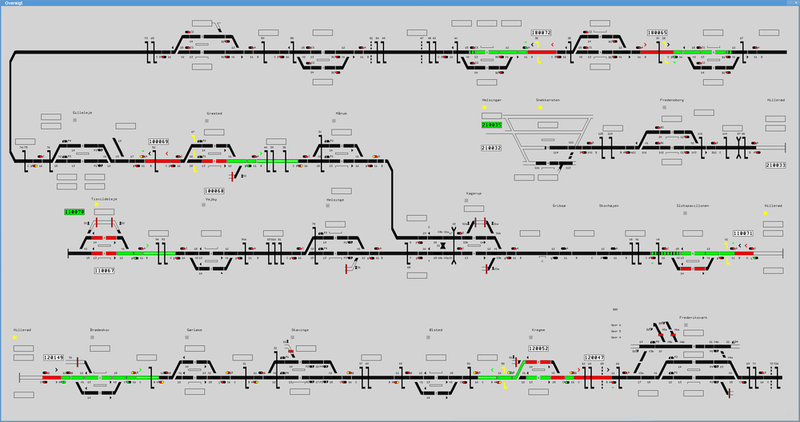 The train graph provides a graphical view of train movements in real time in relation to planned traffic based on the current timetable. This makes it easy to see any variances from the planned traffic pattern. By predicting the train movements, any conflict situations can be detected and handled. 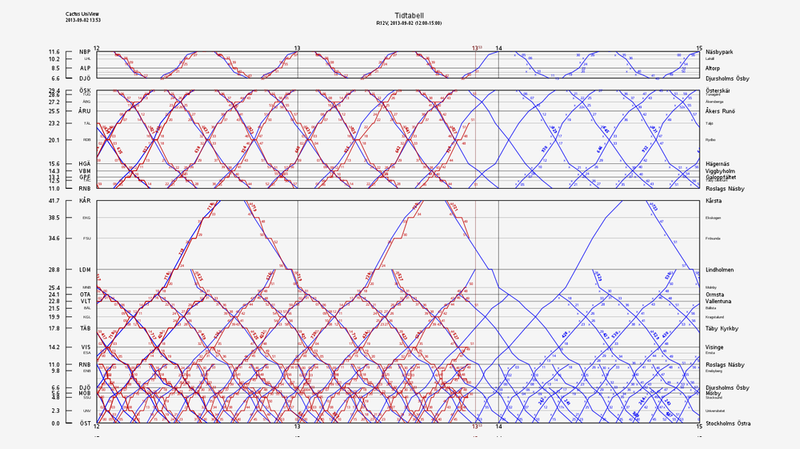 It is also a helpful tool for studying capacity utilisation on a section of track. You decide which technology you want to use to import timetables. For example, you can use Excel files or assign an SQL database for importing over a network. When Cactus TMS has read in a local copy of the timetable, it is easy to go in and edit it where necessary. If an extra train needs to be inserted, for example, the traffic manager can simply copy the timetable for a given train number and run a general update to the times to create a new timetable for a new train number. Punctuality is logged during the journey and compared with the timetable. Colour-coded images mean that the traffic manager is immediately provided with information about delays and can quickly take countermeasures. By selecting a train number in the graphic representation, the traffic manager has direct access to a detailed timetable for the train. The traffic manager can also enter a cause of delay where applicable, thereby supplementing the punctuality report. Cactus TMS is designed to manage and monitor a large number of lines, where traffic managers, engineers, maintenance and administrative staff depend on concurrent access to information in the system. When you log into the system, it displays the functions that your user group has access to. Within the system, the traffic managers can choose the levels of access to be controlled and monitored. The choice may be by station, by sub-section, or for whole lines.